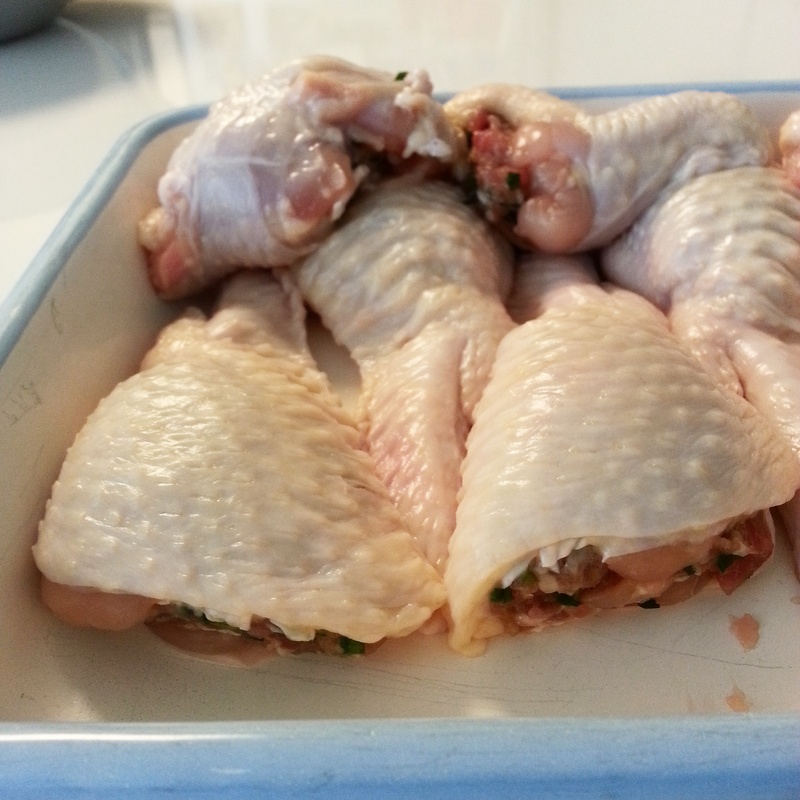 The first time I ever had stuffed chicken wings was at a Thai restaurant in Singapore (Thanying at Amara Hotel). The wings were stuffed with minced chicken, vermicelli, shiitake and cilantro, and glazed with some sort of nam pla and palm sugar mixture. My family always ordered that dish when we ate at Thanying. 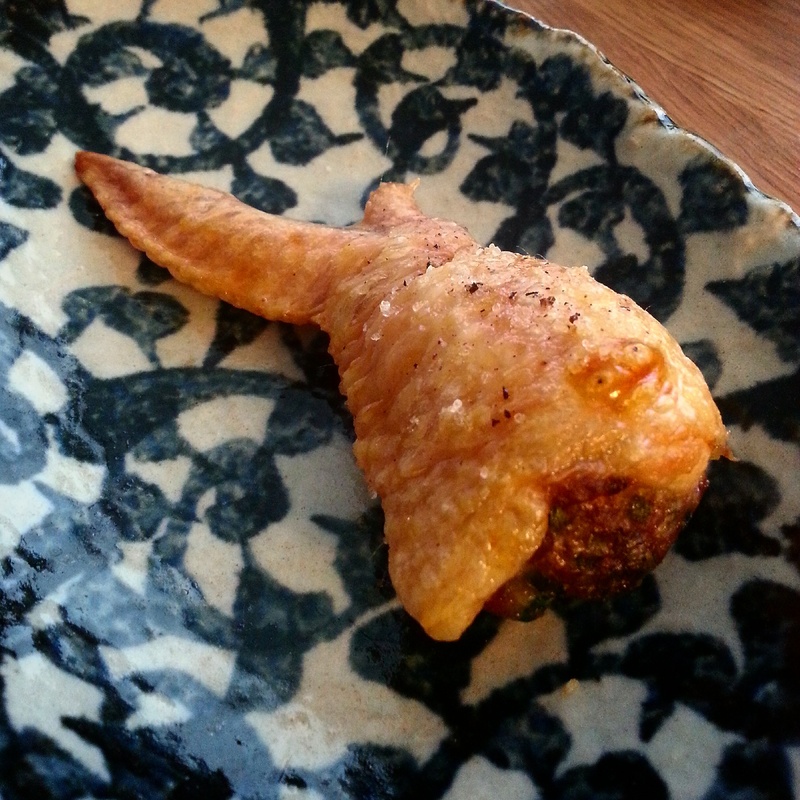 After that I started coming across stuffed wings at Japanese restaurants, and they are called “teba gyoza”. Teba means wings, and they are called gyoza wings because the dumpling skin has been substituted with the chicken skin. I’ve always wondered why you don’t see these more often but once I actually made them and experienced how time consuming it is to make them, it made sense to me. Once you get the hang of it, it becomes quite easy, but until then, it can be quite frustrating. You have to be careful not to tear the skin, and you also want to stuff it as much as you can. To make the filling just combine everything together and cook a little in a saute pan to adjust seasoning to taste. Mix well until it almost looks emulsified (becomes like a paste). Preheat the oven to 350 degrees Fahrenheit. Once you debone all the wings, stuff them with a generous amount of the filling using a small spoon. Line them up on a roasting rack, season them with a bit of salt and pepper (not too much since the filling is well seasoned) and place them in the oven until the skin is nice and golden brown. By this point, the filling should be fully cooked as well.